I am totally *that* mom. : Happy Birthday to My Mom! Originally published on Facebook on January 22, 2017. Posted today for my mother's birthday - Happy Birthday, Mom! Yesterday in D.C. I went to grab a quick selfie with the crowds and signs me behind me. The picture I grabbed isn't what I expected but it's even more poignant. That's my mama behind me. You see, she's always behind me. As a kid whether I wanted to play sports, take dance, or be the youngest person on church council, she was behind me. When I was determined to go away for the summer to work at camp at 15 years old, she was behind me. When I told her I was skipping my senior year of high school and going to college early, she was terrified but she was behind me. When at 17, I traveled the country doing day camps for kids who had recently experienced natural disasters, she was behind me. With every big idea I had and next adventure embarked on, she was behind me. When I graduated college at 20, got married, and started a new and unexpected job she was behind me. When I tackled graduate school, a full-time job, and becoming a mom all at the same time, she was behind me. When I gave birth to two of her grandchildren at home, she was behind me. When we decided homeschooling was the best fit for our kids for a period of time, she was behind me. And when we told the world who my daughter was, a young transgender girl, she was behind me. 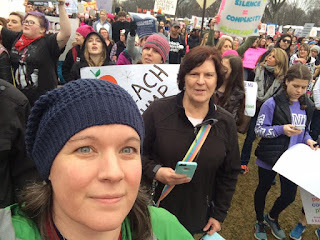 This week, I had the opportunity to go to Creating Change Conference, an amazing conference sponsored by the National LGBTQ Task Force, she said "Go, I'll help with your kids" even if it had meant not being able to go to a march on Saturday. She said she figured freeing me up to do the work I'm doing is her contribution to the movement at this point. And it's a HUGE contribution, always having her behind me, behind my family, behind my daughter. So I went to the conference but shifted some things around so we could go to DC... my transgender daughter and I, with this woman behind us. I haven't always made it easy for her with my affinity for crazy adventures and rejection of any type of normalcy, but she continually shows up, doing what needs to be done at any given time to empower me and now my daughter, to lift us up and to support us... sometimes quietly in the background doing my dishes and laundry when life gets crazy or taking my daughter to dance class and sometimes marching with us and half a million other people for women, for equality, for trans kids, and for justice for all people - regardless of color, culture, creed, ability, economic status, sexuality, or gender identity. I marched for her as much as I do my daughter.